According to former union officials, Bureau of Prison personnel have known for years that the "Cowboys" are guards who routinely beat and abuse inmates at Florence ADX supermax prison in Colorado. Though reports of sadistic, systematic abuses were filed with top officials in the BOP as early as 1995 (and in earlier instances at USP Marion supermax) most of the accused guards continued to work at the prison for four years -- and some may still be there. A longstanding conspiracy of government employees has been committing unthinkable atrocities against the men in their custody. Florence's Warden Joel Knowles and Assistant Warden Jim Greco received monthly reports from the local union president and vice president about the Cowboys abusing prisoners. But instead of investigating the allegations brought by the union leaders, the brutal acts were rewarded with promotions. When Dale Lewsader was the local president of the American Federation of Government Employees (AFGE) union, he requested a congressional investigation in April1996. He wrote those guards "are engaging in illegal acts of physical abuse against inmates. What makes this so bad is that local management knows this is happening and is condoning these assaults. We understand that in some cases supervisors are even ordering the assaults." Tyrone Love confirms guard brutality. He was sent to Florence after the so-called 'crack riots' at Lompoc, California in 1996, when Congress denied the Sentencing Commission recommendation to eliminate the quantity guideline disparities between crack and powder cocaine. Love is serving a 20-year sentence for a non-violent, crack cocaine offense committed in the aftermath of the CIA/Nicaraguan conspiracy that flooded African-American communities with the drug. Upon arriving at Florence ADX with twenty other prisoners from Lompoc in November of 1996, Love heard the screams of fellow inmates ahead of him. They were being 'processed' with brutal beatings as he waited in a small holding cell for his turn. Over 50 Florence employees were in attendance during the beatings, recalls Love. He said the torture was a reminder not to mess with staff. Tyrone Love was one of the black men singled out repeatedly for unusually brutal treatment, replete with racial slurs. Fabricated reports were routinely filed by guards to justify excessive force. Self-inflicted wounds were used as false evidence against inmates. And any guard who dared violate the strict code of silence was told that the Cowboys might be 'slow' in the future to respond to a life-threatening altercation with vengeful inmates. Routinely, guards would drop handcuffed inmates face-first on concrete floors, and would then kick them repeatedly in the ribs, kidneys and testicles. Flaming papers were thrown into cells as a pretext for spraying men with fire extinguishers. Meals were served with feces and urine in the food trays. Faces were smashed into concrete walls. Handcuffs were clamped so tight that wrists and ankles were left lacerated and bruised. Leg shackles cut flesh to the bone when men were forced to run, and when they fell to the ground, they would be kicked, hit and slammed more. These horror stories were documented by the ACLU and others, and are particularly credible as the accounts were told by 23 prisoners who were unable to compare notes with each other in the isolation of the infamous Special Housing Unit known as the SHU. The Bureau of Prisons statement regarding these abuses is that a 'zero tolerance policy' is maintained toward excessive force. Yet the brutality continued at least from January 1995 through July 1997, according to the federal grand jury indictment of seven former prison guards at Florence in November 2000. A lieutenant and two guards had previously pled guilty to beating prisoners in 1999. Incredibly, some of the Cowboys continue to work as guards at the prison, according to Chris Kester, one of the AFGE union leaders who first reported the abuses to the wardens. Kester told the Rocky Mountain News on January 3, "If they come out with under thirty Cowboys, they don't have them all." Tyrone Love has been alone for the past four years. He lives underground, locked down for 23 hours a day. Some prisoners are unable to survive the mental agony of constant isolation. But Love has hope. 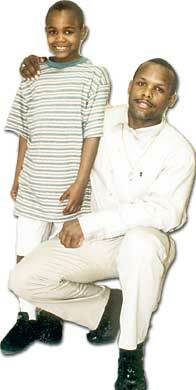 He has faith in Allah, and is looking forward to being reunited with his son, Terrel. He continues to prosecute his civil law suit filed against the Cowboys for the beatings and brutality he endured. Love has two more years to serve and will be released into a faster world after years of slow, solitary confinement.